Unterschiede zum AD30HTC: massig Power aus 4xEl34, Silizium-Dioden-Gleichrichter (Diode Rectifier) anstatt TubeRectifier und analog zur Power überdimensionierte Trafos & Netzteile. Somit hat der Amp deutlich mehr Headroom, keinen Sag, ist tighter in den Bässen und Tiefmitten als ein AD30HTC, weiterhin ermöglicht die Schaltung einen sehr lauten und stabilen Cleanton und kann alles andere natürlich auch immens laut, insgesamt ist durch die höhere Leistung auch der EQ wirkungsvoller. Antesten nach Absprache in 33102 Paderborn / 46535 Dinslaken in Studio/Proberaum möglich. Dubbed „the best amplifier in the world“, by UK magazine Guitarist, the AD140 LEAD is more than you could possibly imagine! 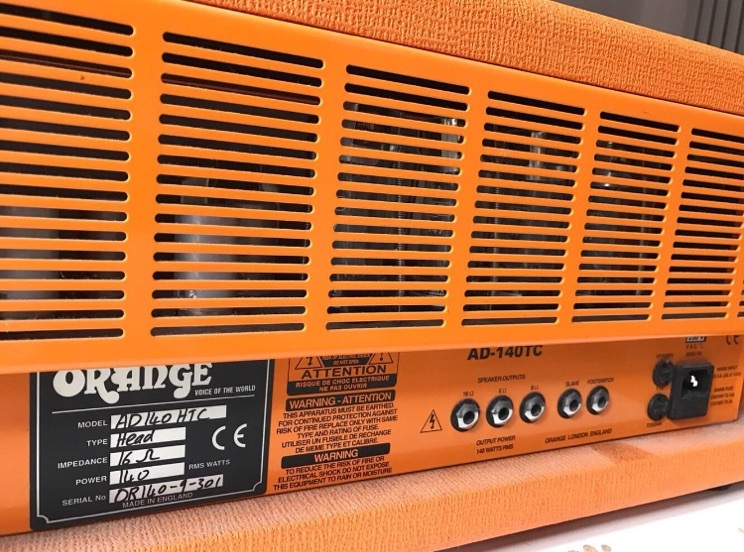 It’s always great to go home, grab a guitar, plug in to your favourite amp, wack both the master and gain up to 10, and wig out… **WARNING** DO NOT TRY THIS WITH THE AD140! Producing 140 watts of clean headroom and a searing 200 watts of thick distortion the AD140 is not only liable to cause you serious health problems but your previously friendly neighbors will certainly not be impressed by your musicianship! This is an amp for guitarists who have tried the rest and need just a little more. On first consideration, many people consider a 140 watt amp to only be suitable for full on stadium rock! Ironically the AD140 is popular with country musicians looking for the cleanest tone possible at high volumes. If you need to be loud, then the AD140 twin channel head should be right at the top of your perfect amplifier wish list! Voiced with slightly less gain and slightly more head room, channel 1 allows you to fully crank the master to obtain a super loud clean tone saturated with warmth. Start dialing in the gain control, and channel 1 will take you seamlessly through snappy break up into crunchy rhythm and finally, full on distortion. This channel is perfect for any rhythm guitar part whether you’re playing country, blues, punk or rock! From warm clean to full on distorted lead guitar, channel 2 has it all! Voiced with more gain, the Orange engineers designed Channel 2 for a fully driven distortion sound without losing the purity of it’s clean tone. It’s this tonal verity that makes the AD twin channel amplifiers so incredibly versatile! Of course you could use channel 1 for clean and channel 2 for lead. But what about channel 1 from distorted rhythm and channel 2 for distorted lead boost. Or even channel 2 for rhythm clean and channel 1 for a loud clean solo boost! The options are endless and the choices are yours.